"A brave man is not one who is not afraid, but one whose will is stronger than his fear." • Use less energy to run fast. • Reduce the risk of pain and injuries. • Avoid “braking” with every step. • Use your body’s natural shock absorption. • Minimize the up and down “bouncing” with each stride. • Distribute running workload optimally to avoid fatigue. • Running similar to how children and some barefoot tribes/hunters naturally run is efficient and prevents injuries. • An old belief used to be that longer strides equal faster runners, but this is more likely to result in injuries and extra energy-consumption. • Physics state that if your foot lands in front of your body’s center of mass it will act like a brake. If you stretch your leg out further you are more likely to land on your heel, and since the leg is more extended the knee will be less enabled to perform its shock-absorbing function. 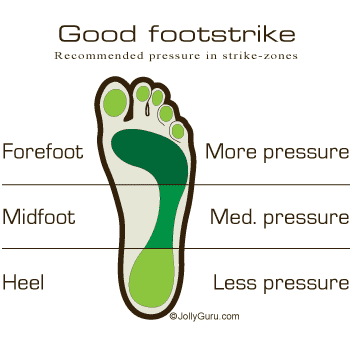 • An out in front foot strike is causing excessive muscle use and is more prone to cause injuries. Furthermore, it puts the leg almost in direct line with the body’s motion and will thus receive a great amount of impact stress. Running technique -braking momentum and jolting joints. • An efficient runner takes relatively short but frequent strides. This minimizes braking and bouncing. 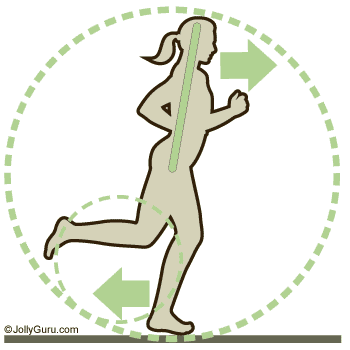 • Runners should seek to imitate the motion of a “wheel” which moves smoothly forward rather than bounces. • Leaning forwards slightly (rather than running vertically upright as most of us tend to do) brings the body a natural forward momentum. • Leaning forward more will increase propulsion (forward motion energy) and result in faster running speed. By cooperating with the force of gravity it propels you forward without having to use your leg-muscles nearly as much. • “Bouncing” up and down with every stride wastes energy and increases impact stress on landing. Learn to run with a smooth horizontal flow. • Shoes add weight and mass to the foot which slows down the runner. • Shoes provide support, which doesn’t allow the foot to strengthen and support itself. • Like wearing thick mittens, wearing shoes also reduce proprioception – the body’s awareness of itself to its environment. • Traditionally, running-shoes has elevated heels, which has conditioned most of us to strike down with the heel first (Heel-strike). Running barefoot or with non-elevated heels creates a more natural running technique, strengthens muscles tendons and ligaments of the foot and promotes a natural running-motion which is less prone to injury. 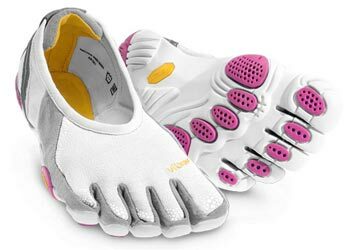 • There are, however, running shoes available with a minimal sole to emulate running barefoot, yet provides a sole just thick enough to protect your feet from sharp items, sores and weather-conditions. 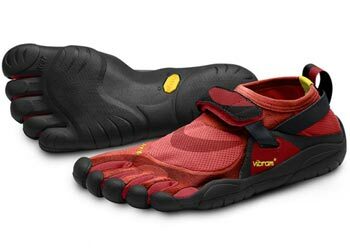 These promote a natural running-style. 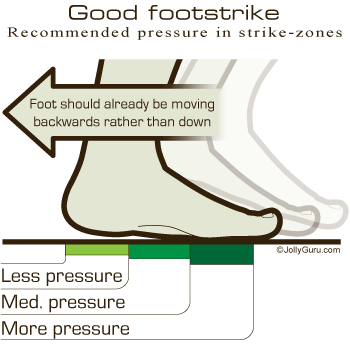 • Heel-strike: The most common type of foot strike. Brakes momentum. Hard strike prone to cause pain or injury. • Mid-foot strike: This is preferred. A good mid-foot strike is when most of the impact is handled by the ball of your foot (forefoot) while the heel only slightly touches the ground. • Forefoot / Toe-strike: Also preferred over heel-strike but overdoing it, by relying only on the forefoot for support, could put much stress on the calves as well as the Achilles tendon. • Natural running involves the mid-foot /forefoot strike. Make sure you are landing mainly on your forefoot / mid-foot rather than your heels. Avoid striking ground with the heel first since the human heel pad is not absorbing much of the force of impact and will thus transmit a shock all the way through the leg to the knee and the hip, eventually causing pain. • Re-adjusting to a natural running-technique may initially make your body sore. Anytime you change your technique, your body will need time to adapt, so start carefully with shorter runs to get accustomed to it. If you are new to running barefoot, you can begin conditioning your soles by simply walking barefoot. • Achilles tendonitis (pain in the heel-tendons) is a common injury when changing techniques too fast. So again, make the adaption very gradually and carefully. • Start by standing up straight with feet parallel. Now straighten your stance by making you as tall as you can, giving you a good aligned posture. • Now, tilt your body slightly forwards and let your legs “fall” forward into a natural running motion. 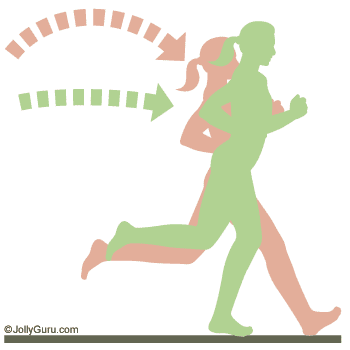 Maintain this straight (from the waist up) but forward-tilted posture while running. • With your knees slightly bent, let your feet land right below the center of your body, or even slightly behind, rather than in front of it. • Do not let your feet land in front of your hip since this will make the leg brake the body’s forward momentum. • When the foot comes down it should preferably already be heading towards your rear. Landing with the foot and leg directly in the push-off position, minimizes contact time between the feet and the ground, and landing and push-off becomes a smooth single moment. • At the end of each stride, letting the heels naturally flick back towards your buttocks will help in creating a smooth elliptical foot motion. 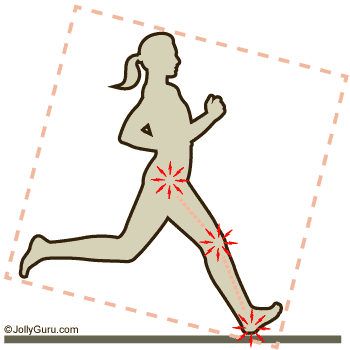 • A good and soft foot strike is less audible (on a floor) so you can try to “quiet” your strides. Just touch the ground lightly and then lift your feet as if running on hot coals. Aim towards “floating” across the ground with less impact. • Keep your eyes looking forward to where you want to go, rather than down. This will help pulling your body forward, and you will breathe easier. • Try taking deep breaths to bring as much oxygen to your lunges as possible and stay energized. • Minimize torso-rotation/movement. Keep your elbows bent and let arms swing back and forth and not so much right and left as some runners have a tendency to do. Did you find this of value? Please pass it on to others using the share-tools below, or share your thoughts in the comments section. this is too good . The informations are really good and awesome. Very important basics of running.